A draft executive order on LGBT rights — which outlines how to roll back former president Barack Obama’s protections and expand legal exemptions based on religious beliefs — has been circulating among journalists and worried progressive groups this week. 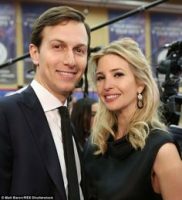 But two sources close to Kushner and Ivanka Trump, who have in the past been supporters of gay rights, said the young couple were both in favor of putting out a clear statement from the president, promising to uphold the 2014 Obama executive order and stopping the momentum for the turnaround in its tracks. This entry was posted in Culture, Truth2Freedom Headline Alerts on February 4, 2017 by Truth2Freedom. This entry was posted in Reblogged Guest Post on February 4, 2017 by Truth2Freedom. More than 13,000 Americans registered to buy a home in New Zealand — 17 times the usual rate — in the week after Donald Trump was elected president. You’re all set — your bags were packed long ago, there’s a dozen solid gold coins stashed inside your belt and a pistol strapped round your waist. There’s no need to say goodbye to the wife and children as they’re already waiting for you 6,000 miles away in New Zealand, having slipped off quietly at the first whiff of global catastrophe. The high-powered motorbike you’ve never used is waiting outside to whisk you to the private airport where your plane sits waiting. A helicopter-ride at the other end, pull up the drawbridge — yes, you have one — and you’re ready to wait, for years if necessary, for civilization to return. The world of Doomsday survivalists or ‘Preppers’ — those preparing themselves for total social collapse — is usually associated with wild-eyed eco-beardies hiding in the woods. But the existence of a very different group of Preppers was laid bare by a political row in New Zealand this week. The row in New Zealand involves scores of mega-rich Americans but has specifically centered on Peter Thiel, the billionaire founder of the internet payment system PayPal and an early investor in Facebook. It is difficult to understand how this complied with the rules, including one that insists foreigners must live there for three years beforehand. Mr Thiel has gushed about his ‘great pride’ in his new citizenship and how he has ‘found no other country that aligns more with my view of the future’. If society collapses, he reasons perversely, getting hold of new spectacles might be a challenge. Ammunition could run out, too. Marvin Liao, a former senior executive at web giant Yahoo, has taken classes in archery and has amassed a small arsenal of other non-firearm weapons to protect his wife and daughter. Survivalists have their own set of acronyms, including WROL (Without Rule Of Law) and LIA (Little Ice Age). (Some of them worry that the latter has just started). They also have secret buzzphrases. ‘Saying you’re “buying a house in New Zealand” is kind of a wink, wink — say no more,’ Reid Hoffman, a venture capitalist told the New Yorker magazine. Naturally, property developers are eagerly capitalizing on such concerns. The Survival Condo Project, a former underground nuclear missile silo in Kansas, has been converted into a 15- storey luxury apartment complex with a pool, gym, classroom and a miniature hospital. All this panic among the super-rich begs an obvious question: what do they know that the rest of us don’t? Certainly, preparing for the Apocalypse has been a multi-billion dollar business for many years. Source: Why Are The World’s Tech Billionaires Building Underground Doomsday Shelters In New Zealand? This entry was posted in Truth2Freedom Headline Alerts on February 4, 2017 by Truth2Freedom. Should Christians be friends with unbelievers? Well there are two biblical concepts at play in this question—the first is the principle of purity and the second is the mandate for evangelism. Christians are called to be pure. We are supposed to guard our hearts, our thoughts, and our ways. The danger of a friendship with a non-believer is that might bring the Christian down. It could bring a Christian down morally, intellectually, and spiritually. The Bible says that “Bad company corrupts good morals” (1 Corinthians 15:33). Be spending time around those who don’t love Jesus or fear the Lord, we run the risk of negatively impacting our own morality, hampering our world-view, and compromising spiritually. That is not a prohibition to Christians against these kind of friendships; but it is a warning—a warning that our friendships we guard our hearts, minds, and affections. This entry was posted in Christian Living on February 4, 2017 by Truth2Freedom. Two weeks ago, we brought you reports that the NFL had asked Lady Gaga to stay away from politics with her halftime performance at the Super Bowl. This week, we can report there’s a strong chance that Lady Gaga has every intention of getting political with her halftime performance at the Super Bowl. EDITOR’S NOTE: The world’s single, largest platform is arguably the Super Bowl halftime show. This year like many of the years before, it will feature a singer who claims to be under demon possession, exhibit Illuminati symbolism, and talks in glowing terms of people connected to the Church of Satan. It hasn’t been about entertainment for a long time now, so pay attention tomorrow. The Devil will be center stage, using his ministers to sing their way into your heart. GRAPHIC WARNING: While this video is not suitable for children, if your children listen to Lady Gaga then they need to watch this. Sounds harmless, right? A celebrity performer using the platform of the single largest annual media event in America to dedicate a performance to “inclusion” and “equality.” What could go wrong? This video is a recap of previous Illuminati symbolism represented in various Superbowl Halftime shows. Madonna, Beyonce, and Katy Perry’s performances are all re-examined as we approach the 2016 Halftime show featuring Coldplay, Beyonce, and Bruno Mars. This, despite well-justified concerns many will have based on last year’s halftime performance, where the NFL allowed Beyoncé to perform the anti-police, pro Black Panther song “Formation,” during the Super Bowl halftime show. Contrasted with the deeds of the flesh is the fruit of the Spirit. Deeds of the flesh are done by a person’s own efforts, whether he is saved or unsaved. The fruit of the Spirit, on the other hand, is produced by God’s own Spirit and only in the lives of those who belong to Him through faith in Jesus Christ. The spiritual behavior of walking by the Spirit (﻿v.﻿ ﻿16﻿) has the negative effect of causing the believer to put away the habitual, ongoing evil deeds of the flesh and positively causes him to bear the good fruit produced by the Spirit. The first contrast between the deeds of the flesh and the fruit of the Spirit is that the products of the flesh are plural, whereas the product of the Spirit is singular. Although Paul does not mention the truth here, there is also a contrast between the degrees to which the deeds and the fruit are produced. A given person may habitually practice only one or two, or perhaps a half dozen, of the sins Paul mentions here. But it would be practically impossible for one person to be habitually active in all of them. The fruit of the Spirit, on the other hand, is always produced completely in every believer, no matter how faintly evidenced its various manifestations may be. The Bible has much to say about fruit, which is mentioned some 106 times in the Old Testament and 70 times in the New. Even under the covenant of law, a believer produced good fruit only by God’s power, not his own. “﻿From Me comes your fruit,﻿” the Lord declared to ancient Israel (﻿Hos. 14:8﻿). In the New Testament such things as praise of the Lord (﻿Heb. 13:15﻿), winning converts to Christ (﻿1 Cor. 16:15﻿), and godly work in general (﻿Col. 1:10﻿) are spoken of as spiritual fruit produced through believers. 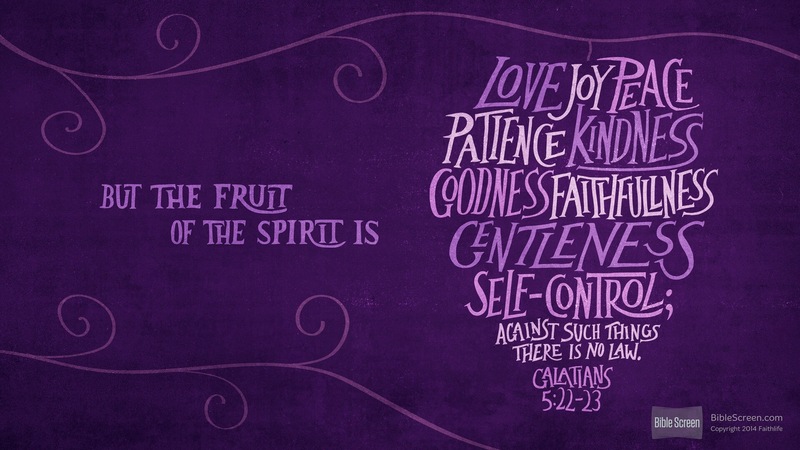 But such action fruit must come from attitude fruit, and that is the kind of fruit Paul focuses on in ﻿Galatians 5:22–23﻿. If those attitudes are characteristic of a believer’s life, the fruit of active good works will inevitably follow. The Spirit never fails to produce some fruit in a believer’s life, but the Lord desires “﻿much fruit﻿” (﻿John 15:8﻿). As an unredeemed person, possessing only a fallen, sinful nature will inevitably manifest that nature in “﻿the deeds of the flesh﻿” (﻿v.﻿ ﻿19﻿), so a believer, possessing a redeemed new nature will inevitably manifest that new nature in the fruit of the Spirit. But it is always possible for the believer to bear and manifest more fruit if he is receptive to the Spirit. The Spirit’s provision of fruit might be compared to a man standing on a ladder in an orchard, picking the fruit and dropping it into a basket held by a helper below. No matter how much fruit is picked and dropped, the helper will not receive any unless he is standing under the ladder with his basket ready. The fruit of the Spirit is the outward indicator of salvation. A believer’s sonship to God and citizenship in His kingdom (﻿cf.﻿ ﻿v.﻿ ﻿21﻿) are manifested by the fruit the Spirit produces in his life. “﻿You will know [men] by their fruits,﻿” Jesus said. “﻿Grapes are not gathered from thorn bushes, nor figs from thistles, are they? Even so, every good tree bears good fruit; but the bad tree bears bad fruit. A good tree cannot produce bad fruit, nor can a bad tree produce good fruit﻿” (﻿Matt. 7:16–18﻿). In ﻿verses 22–23﻿ Paul lists nine representative characteristics of the godly fruit produced by the Holy Spirit in a believer’s life. Although many attempts have been made to categorize these nine virtues in various groupings, most such schemes seem artificial and irrelevant. Whether or not satisfactory classifications of them can be made, it is important to remember that these are multiple characteristics of but one fruit and are therefore inextricably related to one another. They are not produced nor can they be manifested in isolation from each other. Rather paradoxically, all of the nine manifestations of the fruit of the Spirit are also commanded of believers in the New Testament. Also in every case, Jesus can be seen to be the supreme example and the Holy Spirit to be the source. Love. The first characteristic of spiritual fruit is love, the supreme virtue of Christian living (﻿1 Cor. 13:13﻿). Some commentators insist that in this context love is a synonym for fruit and therefore encompasses the other characteristics in the list. In any case, love is clearly dominant. As Paul has just declared, “﻿the whole Law is fulfilled in one word, in the statement, ‘﻿You shall love your neighbor as yourself﻿’﻿” (﻿Gal. 5:14﻿; ﻿cf.﻿ ﻿Rom. 13:10﻿). Agapē love is the form of love that most reflects personal choice, referring not simply to pleasant emotions or good feelings but to willing, self-giving service. “﻿God demonstrates His own love toward us, in that while we were yet sinners, Christ died for us﻿” (﻿Rom. 5:8﻿). In the same way, the most extreme sacrificial choice a loving person can make is to “﻿lay down his life for his friends﻿” (﻿John 15:13﻿). The apostle John expresses those two truths together in his first letter: “﻿We know love by this, that He laid down His life for us; and we ought to lay down our lives for the brethren﻿” (﻿1 John 3:16﻿). But love is tested long before it is called on to offer that supreme sacrifice. As John goes on to say, “﻿Whoever has the world’s goods, and beholds his brother in need and closes his heart against him, how does the love of God abide in him?﻿” (﻿v.﻿ ﻿17﻿). A person who thing his love is great enough to sacrifice his life for fellow believers but who fails to help them when they have less extreme needs is simply fooling himself. True agapē love is a sure mark of salvation. “﻿We know that we have passed out of death into life,﻿” John says, “﻿because we love the brethren … Everyone who loves is born of God and knows God﻿” (﻿1 John 3:14﻿; ﻿4:7﻿). By the same token, as John repeatedly makes clear throughout the same letter, having a habitually unloving spirit toward fellow Christians is reason for a person to question his salvation (see e.g., ﻿2:9﻿, ﻿11﻿; ﻿3:15﻿; ﻿4:8﻿, ﻿20﻿). Jesus Christ is the supreme example of this supreme virtue. It was not only the Father’s love but also His own love that led Jesus to lay down His life for us, demonstrating with His own self-sacrifice the love that gives its life for its friends. And before He made the ultimate sacrifice, He demonstrated the same self-giving love in many lesser ways. As Jesus saw Mary and the others weeping because of Lazarus’s death, He, too, wept (﻿John 11:33–35﻿). He did not grieve for the fact that Lazarus had died, because He purposely delayed coming to Bethany until His dear friend was dead, in order to demonstrate His power to raise him from the grave. Jesus wept because of the great evil, destruction, and human misery caused by sin, whose final wages is always death (﻿Rom. 6:23﻿). For believers, love is not an option but a command. “﻿Walk in love,﻿” Paul declared, “﻿just as Christ also loved you, and gave Himself up for us, an offering and a sacrifice to God as a fragrant aroma﻿” (﻿Eph. 5:2﻿). Yet the command cannot be fulfilled apart from the Holy Spirit, the source of this and all the other manifestations of spiritual fruit. “﻿The love of God has been poured out within our hearts through the Holy Spirit who was given to us,﻿” Paul explained to Roman believers (﻿Rom. 5:5﻿), and it was for such “﻿love in the Spirit﻿” that he gave thanks for the believers in Colossae (﻿Col. 1:8﻿). Joy. The second manifestation of the fruit of the Spirit is joy. Chara (joy) is used some 70 times in the New Testament, always to signify a feeling of happiness that is based on spiritual realities. Joy is the deep-down sense of well-being that abides in the heart of the person who knows all is well between himself and the Lord. It is not an experience that comes from favorable circumstances or even a human emotion that is divinely stimulated. It is God’s gift to believers. As Nehemiah declared, “﻿The joy of the Lord is your strength﻿” (﻿Neh. 8:10﻿). Joy is a part of God’s own nature and Spirit that He manifests in His children. Speaking of how we feel about the Lord Jesus Christ, Peter wrote, “﻿Though you have not seen Him, you love Him, and though you do not see Him now, but believe in Him, you greatly rejoice with joy inexpressible and full of glory﻿” (﻿1 Pet. 1:8﻿). Joy is the inevitable overflow of receiving Jesus Christ as Savior and of the believer’s knowing His continuing presence. Joy not only does not come from favorable human circumstances but is sometimes greatest when those circumstances are the most painful and severe. Shortly before His arrest and crucifixion, Jesus told His disciples, “﻿Truly, truly, I say to you, that you will weep and lament, but the world will rejoice; you will be sorrowful, but your sorrow will be turned to joy﻿” (﻿John 16:20﻿). To illustrate that truth Jesus compared divine joy to a woman in childbirth. “﻿She has sorrow, because her hour has come; but when she gives birth to the child, she remembers the anguish no more, for joy that a child has been born into the world. Therefore you too now have sorrow; but I will see you again, and your heart will rejoice, and no one takes your joy away from you﻿” (vv. ﻿21–22﻿). God’s joy is full, complete in every way. Nothing human or circumstantial can add to it or detract from it. But it is not fulfilled in a believer’s life except through reliance on and obedience to the Lord. “﻿Ask, and you will receive,﻿” Jesus went on to explain, “﻿that your joy may be made full﻿” (﻿John 16:24﻿). One of John’s motivations in writing his first epistle was that his joy might “﻿be made complete﻿” (﻿1 John 1:4﻿). Jesus Himself is again our supreme example. He was “﻿a man of sorrows, and acquainted with grief﻿” (﻿Isa. 53:3﻿; ﻿cf.﻿ ﻿Luke 18:31–33﻿), but, just as He had promised for His disciples, His sorrow was turned into joy. “﻿For the joy set before Him [He] endured the cross, despising the shame, and has sat down at the right hand of the throne of God﻿” (﻿Heb. 12:2﻿). Despite the misunderstanding, the rejection, the hatred, and the pain He endured from men while incarnate among them, the Lord never lost His joy in the relationship He had with His Father. And that joy He gives to each of His followers. Although joy is a gift of God through His Spirit to those who belong to Christ, it is also commanded of them “﻿Rejoice in the Lord always; again I will say, rejoice!﻿” Paul commands (﻿Phil. 4:4﻿; ﻿cf.﻿ ﻿3:1﻿). Because joy comes as a gift from Him, the command obviously is not for believers to manufacture or try to imitate it. The command is to gratefully accept and revel in this great blessing they already possess. “﻿For the kingdom of God is not eating and drinking, but righteousness and peace and joy in the Holy Spirit﻿” (﻿Rom. 14:17﻿). Peace. If joy speaks of the exhilaration of heart that comes from being right with God, then peace (eirēnē) refers to the tranquility of mind that comes from that saving relationship. The verb form has to do with binding together and is reflected in the modern expression “﻿having it all together.﻿” Everything is in place and as it ought to be. Like joy, peace has no relationship to circumstances. Christians know “﻿that God causes all things to work together for good to those who love God, to those who are called according to His purpose﻿” (﻿Rom. 8:28﻿). Because God is in control of all aspects of a believer’s life, how his circumstances may appear from a human perspective makes no ultimate difference. That is why Jesus could say without qualification to those who trust in Him, “﻿Let not your heart be troubled﻿” (﻿John 14:1﻿). There is absolutely no reason for a believer to be anxious or afraid. Jesus was the Prince of Peace, both in the sense that He was supremely peaceful Himself and in the sense that He dispenses His peace to those who are His. Even when He confronted Satan face-to-face in the wilderness, Jesus had perfect peace, knowing His heavenly Father was continually with Him and would supply His every need (﻿Matt. 4:1–11﻿). It is His own peace that He bequeaths to His disciples: “﻿Peace I leave with you; My peace I give to you; not as the world gives, do I give to you﻿” (﻿John 14:27﻿). “﻿The things you have learned and received and heard and seen in me, practice these things,﻿” Paul said; “﻿and the God of peace shall be with you﻿” (﻿Phil. 4:9﻿). Because they have the God of peace in their hearts, believers need “﻿be anxious for nothing,﻿” having “﻿the peace of God, which surpasses all comprehension, [to] guard [their] hearts and [their] minds in Christ Jesus﻿” (﻿v.﻿ ﻿6–7﻿). Patience. Makrothumia (patience) has to do with tolerance and long-suffering that endure injuries inflicted by others, the calm willingness to accept situations that are irritating or painful. God Himself is “﻿slow to anger﻿” (﻿Ps. 86:15﻿) and expects His children to be the same. Just as believers should never “﻿think lightly of the riches of [God’s own] kindness and forbearance and patience﻿” (﻿Rom. 2:4﻿), they should themselves manifest those attributes of their heavenly Father. In the last days, arrogant unbelievers will taunt Christians by asking, “﻿Where is the promise of [Christ’s] coming? For ever since the fathers fell asleep, all continues just as it was from the beginning of creation﻿” (﻿2 Pet. 3:4﻿). In their sin-darkened minds unbelievers will fail to see that, just as in the days of Noah, when God patiently delayed the Flood in order to give men more time to repent (﻿1 Pet. 3:20﻿), it is also because of His merciful patience that He forestalls Christ’s second coming and the accompanying judgment on unbelievers, “﻿not wishing for any to perish but for all to come to repentance﻿” (﻿2 Pet. 3:9﻿). Paul confessed that, as the foremost of sinners, he found mercy in God’s sight “﻿in order that in [him] as the foremost, Jesus Christ might demonstrate His perfect patience, as an example for those who would believe in Him for eternal life﻿” (﻿1 Tim. 1:15–16﻿). Believers are commanded to emulate their Lord’s patience. “﻿As those who have been chosen of God, holy and beloved,﻿” they are to “﻿put on a heart of … patience﻿” (﻿Col. 3:12﻿), especially with fellow believers, “﻿showing forbearance to one another in love﻿” (﻿Eph. 4:2﻿). Like Timothy, all Christian teachers and leaders are to minister “﻿with great patience﻿” (﻿2 Tim. 4:2﻿). Kindness. Chrēstotēs (kindness) relates to tender concern for others. It has nothing to do with weakness or lack of conviction but is the genuine desire of a believer to treat others gently, just as the Lord treats him. Paul reminded the Thessalonians that, even though he was an apostle, he “﻿proved to be gentle among [them], as a nursing mother tenderly cares for her own children﻿” (﻿1 Thess. 2:6–7﻿). Jesus’ kindness is the believer’s example. When “﻿some children were brought to Him so that He might lay His hands on them and pray; and the disciples rebuked them … Jesus said, ‘﻿Let the children alone, and do not hinder them from coming to Me; for the kingdom of heaven belongs to such as these﻿’﻿” (﻿Matt. 19:13–14﻿). On another occasion He said, “﻿Come to Me, all who are weary and heavy-laden, and I will give you rest. Take My yoke upon you, and learn from Me, for I am gentle and humble in heart; and you shall find rest for your souls﻿” (﻿Matt. 11:28–29﻿). Just as their Lord is kind, His servants are commanded not to “﻿be quarrelsome, but [to] be kind to all﻿” (﻿2 Tim. 2:24﻿). And just as He does with all the other manifestations of His divine fruit, the Holy Spirit gives God’s children kindness (﻿2 Cor. 6:6﻿). Goodness. Agathos (goodness) has to do with moral and spiritual excellence that is known by its sweetness and active kindness. Paul helped define this virtue when he observed that “﻿one will hardly die for a righteous man; though perhaps for the good man someone would dare even to die﻿” (﻿Rom. 5:7﻿). A Christian can be morally upright but still not manifest the grace of goodness. He may be admired and respected for his high moral standards and might even have a friend who would risk his life for him. But the upright person who also has goodness is much more likely to have serf-sacrificing friends. Joseph was such a righteous and good man. When he learned that Mary was pregnant but did not yet know it was by the Holy Spirit, “﻿being a righteous man﻿” he could not bring himself to marry her, assuming she had been unfaithful. But being also a good man, he could not bear the thought of disgracing his beloved Mary and therefore “﻿desired to put her away secretly﻿” (﻿Matt. 1:19﻿). David had a deep understanding of God’s goodness, as he repeatedly reveals in his psalms. “﻿Surely goodness and loving-kindness will follow me all the days of my life, and I will dwell in the house of the Lord forever,﻿” he rejoiced (﻿Ps. 23:6﻿). He confessed that he would, in fact, “﻿have despaired unless [he] had believed that [he] would see the goodness of the Lord in the land of the living﻿” (﻿Ps. 27:13﻿). As with every grace the Spirit provides, believers are, commanded to exemplify goodness. Later in the letter Paul exhorts, “﻿While we have opportunity, let us do good to all men, and especially to those who are of the household of the faith﻿” (﻿Gal. 6:10﻿). “﻿To this end also we pray for you always,﻿” he wrote to the Thessalonians, “﻿that our God may count you worthy of your calling, and fulfill every desire for goodness and the word of faith with power﻿” (﻿2 Thess. 1:11﻿). Faithfulness. Pistis (faithfulness) is the manifestation of the fruit of the Spirit that pertains to loyalty and trustworthiness. Jeremiah declared that “﻿the Lord’s loving-kindnesses indeed never cease, for His compassions never fail. They are new every morning; great is Thy faithfulness﻿” (﻿Lam. 3:22﻿). Because Jesus was faithful, He “﻿emptied Himself, taking the form of a bond-servant, and being made in the likeness of men. And being found in appearance as a man, He humbled Himself by becoming obedient to the point of death, even death on a cross.﻿” And because of the Son’s faithfulness, the Father “﻿highly exalted Him, and bestowed on Him the name which is above every name﻿” (﻿Phil. 2:7–9﻿). And as He was faithful when He came to earth the first time, He will be faithful to come again “﻿in just the same way as you have watched Him go into heaven﻿” (﻿Acts 1:11﻿). “﻿Faithful is He who calls you,﻿” Paul said, “﻿and He also will bring it to pass﻿” (﻿1 Thess. 5:24﻿). In his great vision on Patmos, John saw Christ seated on “﻿a white horse, and He who sat upon it is called Faithful and True﻿” (﻿Rev. 19:11﻿). The “﻿servants of Christ, and stewards of the mysteries of God﻿” are to be like their Lord in being “﻿found trustworthy﻿” (﻿1 Cor. 4:1–2﻿). “﻿Be faithful unto death,﻿” the Lord assures His followers, “﻿and I will give you the crown of life﻿” (﻿Rev. 2:10﻿). Gentleness. Prautēs includes the idea of gentleness, but is usually better translated meekness. In his helpful volume Synonyms of the New Testament, R. C. Trench writes that prautēs does not consist in a person’s “﻿outward behavior only; nor yet in his relations to his fellow-men; as little in his mere natural disposition. Rather it is an inwrought grace of the soul; and the exercises of it are first and chiefly towards God. It is that temper of spirit in which we accept His dealings with us as good, and therefore without disputing or resisting﻿” (Grand Rapids: Eerdmans, 1953). It is that humble and gentle attitude that is patiently submissive in every offense, while being free of any desire for revenge or retribution. Of the nine characteristics of the fruit of the Spirit, this one and the one following do not apply to God as God. The Old Testament never refers to God as being meek, and in the New Testament only the Son is spoken of as meek, and that only in His incarnation. In the New Testament prautēs is used to describe three attitudes: submissiveness to the will of God (﻿Col. 3:12﻿), teachableness (﻿James 1:21﻿), and consideration of others (﻿Eph. 4:2﻿). Although He was God, while He lived on earth as the Son of Man, Jesus was “﻿gentle [prautēs] and humble in heart﻿” (﻿Matt. 11:29﻿; ﻿cf.﻿ ﻿21:5﻿; ﻿2 Cor. 10:1﻿). Like their Lord, believers are to actively pursue meekness and gentleness (﻿1 Tim. 6:11﻿) and to wear them like a garment (﻿Col. 3:12﻿). Self-control. Enkrateia (serf-control) has reference to restraining passions and appetites. As with meekness, however, this grace does not apply to God, who obviously does not need to restrain Himself. “﻿For I, the Lord, do not change,﻿” He informs us (﻿Mal. 3:6﻿). In His eternal being, the Lord “﻿Jesus Christ is the same yesterday and today, yes and forever﻿” (﻿Heb. 13:8﻿). Perfect holiness possesses perfect control. But in His incarnation Christ was the epitome of self-control. He was never tempted or tricked into doing or saying anything that was not consistent with His Father’s will and His own divine nature. Again like Jesus, believers should “﻿exercise self-control in all things﻿” (﻿1 Cor. 9:25﻿; ﻿cf.﻿ ﻿7:9﻿), “﻿applying all diligence, in [their] faith [to] supply … self-control﻿” (﻿2 Pet. 1:5–6﻿). Against such things there is no law, Paul says. Even unbelievers do not make laws against such things as those which the fruit of the Spirit produces. The world does not make laws against such behavior, but generally prizes it. Even if some consider such things to be signs of weakness, they cannot escape recognizing that they are never harmful. There is certainly no law of God against such things, because those are the very virtues He wants all men to have and that He gives to them when they put their trust in Jesus Christ as Lord and Savior. “﻿For if these qualities are yours and are increasing,﻿” Peter explains in regard to a similar list of virtues, “﻿they render you neither useless nor unfruitful in the true knowledge of our Lord Jesus Christ﻿” (﻿2 Pet. 1:8﻿). The believer who walks in the Spirit and manifests His fruit does not need a system of law to produce the right attitudes and behavior-hey rise from within him. This entry was posted in Daily Devotional Guide, Verse of the day on February 4, 2017 by Truth2Freedom. My own experience has taught me much about the different levels of spiritual growth described by the apostle John in today’s verse. When I was a spiritual babe, I was lost in the euphoria of loving the Lord and didn’t know much theology. At that time I was easily influenced by anyone’s teaching. Later, as I learned the Word of God, false doctrine no longer deceived me; it made me angry. And now, as I have grown in my knowledge of the Word, it’s my desire to know God more intimately, which is the final level of growth. Spiritual fathers not only know the Bible, but also know deeply the God who wrote it. Spiritual growth progresses from knowing you are a Christian to knowing the Word of God to knowing God Himself. The way to know God is to spend your life focusing on His glory, thus learning to understand the fullness of His person. That focus becomes a magnet drawing you upward through the levels of maturity. When God freed Israel to take her to the promised land, He said: “You shall have no other gods before Me” (Ex. 20:3). Later Moses told the Israelites, “The Lord, He is God; there is no other besides Him” (Deut. 4:35) and “The Lord is our God, the Lord is one!” (6:4). Israel was to believe in the one and only God. But Jesus claimed to be God. Is He God number two? Not at all. In Mark 12:29–30, Jesus quoted Deuteronomy 6:4–5: “ ‘Hear, O Israel! The Lord our God is one Lord; and you shall love the Lord your God with all your heart, and with all your soul, and with all your mind, and with all your strength.’ ” If Jesus were another God He might have said, “Split your allegiance between the two of us.” But Jesus says we are to love God with undivided commitment. Therefore He agrees with Moses that there is only one God. However, He also says, “I and the Father are one” (John 10:30). Paul also discusses the unity of God in 1 Corinthians 8. The pagan priests in Corinth would often sell the meat that had been sacrificed to idols. Some new Christians were offended when other Christians ate that meat. In response, Paul told them, “Concerning the eating of things sacrificed to idols, we know that there is no such thing as an idol in the world” (v. 4). Since an idol represented a nonexistent god, there was nothing wrong with eating the food. He continued, “There is no God but one. For even if there are so–called gods whether in heaven or on earth, as indeed there are many gods and many lords, yet for us there is but one God, the Father, from whom are all things, and we exist for Him; and one Lord, Jesus Christ, through whom are all things, and we exist through Him” (vv. 4–6). How can all things be from God the Father, for whom we exist, and by the Lord Jesus Christ, through whom we exist? Because they are one. Suggestions for Prayer: Praise God as David did: “For this reason Thou art great, O Lord God; for there is none like Thee, and there is no God besides Thee” (2 Sam. 7:22). For Further Study: Read Ezekiel 6. What was God’s response to Israel’s idolatry? ✧ How does God feel about anything that might take first place in your heart instead of Him? Wherever faith has been original, wherever it has proved itself to be real, it has invariably had upon it a sense of the present God. The holy Scriptures possess in marked degree this feeling of actual encounter with a real Person. The men and women of the Bible talked with God. They spoke to Him and heard Him speak in words they could understand. With Him they held person-to-person interaction, and a sense of shining reality is upon their words and deeds…. Every believer who would be a soul winner must emulate the key principles Jesus exemplified as the model evangelist—not only in this one occasion but throughout His earthly ministry. Think about the following six, and seek to implement them as you witness for Him. First, Jesus was always available. He never refused a genuine request for help from penitent sinners or the downtrodden. Second, Jesus showed no favoritism. Neither Jairus nor the Roman centurion had an advantage over the woman of Sychar or the woman caught in adultery. Third, the Lord was completely sensitive to the needs around Him. He always could discern the open heart of someone ready to come to Him. In spite of the pressing crowd, He noticed and responded to the woman who touched the hem of His garment (Matt. 9:20–22). Fourth, Christ usually secured a public profession or testimony from the sinner, even including a specific instruction (e.g., the man delivered from demons, Mark 5:19). Fifth, Jesus showed love and tenderness to those He witnessed to. The Samaritan woman at the well was one such recipient. She was a religious outcast and an adulterer, yet He clearly and gently led her to saving faith. Sixth, Jesus always had time to speak to others. Even while on the way to heal Jairus’s daughter, He stopped long enough to heal the woman who had a hemorrhage for twelve years. We still live in a time of gracious evangelism, as so perfectly exemplified by our Lord and Savior. How obedient is your church being to this model? How obedient are you being to it as an individual? But unto the Son he saith, Thy throne, O God, is for ever and ever. The more we study the words of our Lord Jesus Christ when He lived on earth among us, the more certain we are about who He is. It is true that Jesus used the term “Son of Man” frequently. But He testified boldly, even among those who were His sworn enemies, that He was God. He said with great forcefulness that He had come from the Father in heaven and that He was equal with the Father. Bible-believing Christians stand together on this. They may differ about the mode of baptism, church polity or the return of the Lord. But they agree on the deity of the eternal Son. Jesus Christ is of one substance with the Father—begotten, not created (Nicene Creed). In our defense of this truth, we must be very careful and bold—belligerent, if need be! Christ is the brightness of God’s glory and the express image of God’s Person! Lord Jesus, the only hope the world has is that You are One with the Father. You are God Almighty! You are our Messiah! I worship You today. Despite their shortcomings, people of kindred spirit are precious gifts from the Lord. Timothy was Paul’s trusted companion in the gospel. In Philippians 2:20 Paul describes him as a man “of kindred spirit.” That is, they were like-minded, sharing the same love for Christ and His church. Elsewhere Paul described Timothy as his “beloved and faithful child in the Lord” (1 Cor. 4:17) and as a “fellow-worker in the gospel of Christ” (Rom. 16:21; 1 Thess. 3:2). Those are significant compliments coming from Paul, whose standard of ministry and personal integrity was very high. However, as godly and useful as Timothy was, he apparently struggled with many of the same weaknesses we face. For example, 2 Timothy implies he might have been intimidated by the false teachers who challenged his leadership (1:7). He perhaps was somewhat ashamed of Christ (1:8) and was tempted to alter his theology to avoid offending those who disagreed with sound doctrine (1:13–14). He might have been neglecting his studies in the Word (2:15) and succumbing to ungodly opinions (2:16–17). Other struggles are implied as well. Paul wrote to strengthen Timothy’s spiritual character and to encourage him to persevere in the face of severe trials. Despite those apparent weaknesses, Paul valued Timothy highly and entrusted enormous ministerial responsibilities to him. In addition, Timothy’s friendship and ministry were sources of great joy and strength to Paul. I pray that you have people of kindred spirit in your life—brothers and sisters in Christ who encourage you, pray for you, and hold you accountable to God’s truth. Like Timothy, they may not be all you want them to be, but they are precious gifts from God. Esteem them highly, and pray for them often. Do everything you can to reciprocate their ministry in your life. If perhaps you lack such friends, seek the fellowship of a local church where Christ is exalted, His Word is taught, and holy living is encouraged. Build relationships with mature Christians who will stimulate you to love and good deeds (Heb. 10:24). Suggestions for Prayer: Identify three people who are of kindred spirit with you. Pray for them. Tell them how much you appreciate their examples and ministries. For Further Study: Read 2 Timothy 1:1–14. ✧ What were Paul’s admonitions to Timothy? ✧ How might they apply to you? Never while the stars burn in their silence can it be said that God loves the sin in the sinner. Never can it be said that the holy God loves an unholy thing—and yet God loves sinners! God loves sinners for that which He sees in them of His lost and fallen image, for God can never love any thing but Himself, directly. He loves everything else for His own sake. So, you are loved of God—but you are loved of God for Jesus’ sake! Man was made in the image of God, and while sin has ruined him and condemned him to death forever unless he be redeemed through the blood of Jesus Christ, mankind is a being only one degree removed from the angels. But sin, God knows, is like a cancer in the very being of man. Although once made in the image of God, he is now a dying man, sick unto spiritual death, because of the poison of sin. But extract and take out that sin and you have the image of God again! And Jesus Christ was the image of God because He was a man without sin. God sees in Jesus Christ what you would have been! He sees that in His perfect humanity, not His deity—for you and I could never be divine in that sense. When Jesus Christ came to us, He was incarnated in the body of a man without embarrassment and without change, because man was an image of the God who made him. MacArthur, J. (2001). Truth for today : a daily touch of God’s grace (p. 47). Nashville, Tenn.: J. Countryman. MacArthur, J. (2008). Daily readings from the life of Christ (p. 43). Chicago: Moody Publishers. MacArthur, J. F., Jr. (1993). Drawing Near—Daily Readings for a Deeper Faith (p. 47). Wheaton, IL: Crossway Books. This entry was posted in Daily Devotional Guide on February 4, 2017 by Truth2Freedom. Leaving the NAR Church: Erin’s story. (Washington, D.C.) — You absolutely have to watch this message. It is one of the most powerful, most compelling, most winsome and moving presentations of the Gospel of Jesus Christ I have ever heard delivered. It was delivered at the National Prayer Breakfast on Thursday morning in Washington. It was delivered by the Chaplain of the Senate to the President of the United States. It was delivered to more than 4,000 government, business and religious leaders from all over the United States and from more than 160 countries around the world. It was such an honor to be there, and it is something I will never forget. Honestly, I’d never heard of retired U.S. Rear Admiral — who now serves as the Senate Chaplain — Barry Black before. I’d heard of the Christian musical group, “Mercy Me,” and was so glad they were performing songs like, “I Can Only Imagine.” They were outstanding.